SP Setia Bhd, Malaysia’s biggest property developer, fell to a 10-day low after saying fiscal second-quarter net income dropped 15 per cent and JPMorgan Chase & Co downgraded the stock. The shares slid 3.7 per cent to RM4.22 at 12:30pm break, set for the lowest level since June 9. The stock is the worst performer on the benchmark Kuala Lumpur Composite Index today. The shares, which have surged 36 per cent this year, outpacing the benchmark index’s 21 per cent advance, have taken into account the outlook for earnings and the prospects for a liberalisation in government policies that may benefit the property industry, JPMorgan said in a report today. “The good news has been priced in,” Simone Yeoh, an analyst at JPMorgan, said in the report. The shares have outperformed and trade at 25 times 2010 expected earnings, she said. SP Setia’s price-to-earnings multiple is double the average of 13 times among Malaysian property stocks in Malaysia, according to data compiled by Bloomberg. Yeoh cut her rating on the company to “underweight” from “neutral” and lowered the target price to RM3.60 from RM3.80. SP Setia in April led a rally among Malaysian property developers that made them the country’s best performers for that month, after central bank data showed loans approved for home purchases in March jumped the most in at least a year. SP Setia’s profit in the three months ended April 30 dropped to RM40.5 million because of lower profit margins as the cost of building materials rose. While the company’s sales momentum has picked up, “aggressive” incentives are putting profit margins under pressure, according to the JPMorgan report. SP Setia raked in RM803 million of sales as at June 15, as the company, in its property campaign, absorbed buyers’ stamp duties, legal fees and interest costs during the construction period. The company is boosting sales by “sacrificing margins,” Ong Chee Ting, an analyst at Maybank Investment Bank Bhd, said in a report today. The shares are “way too expensive,” he said. KUALA LUMPUR: IJM Corp Bhd said its joint venture has won a RM303mil contract from Tamouh Investments LLC to help build a hotel at Al Reem Island in Abu Dhabi, the United Arab Emirates. The contract, awarded to a company owned by IJM and LFE Corp Bhd, involves the construction and completion of one block of 34-storey five-star hotel tower on three-storey podium, a 24-storey hotel apartment on a three-storey podium, two levels basement carpark and other associated foundation and external works. The package one project is expected to be completed on Feb 28, 2010. The joint-venture company is 70:30 owned by IJM Construction Sdn Bhd and LFE Engineering Sdn Bhd, which are wholly owned units of IJM and LFE Corp respectively. IJM Corp, Malaysia’s second biggest construction company, rose for the first time in seven days after OSK Research Sdn Bhd raised the stock rating on the builder’s RM303 million (US$86 million) Abu Dhabi project. The shares added 1.8 per cent to RM5.55 at midday break, bound for the largest increase since June 10. The “Middle Eastern delight” led Jeremy Goh, an analyst at OSK Research, to upgrade IJM to “trading buy” from “neutral” and raised the stock’s target price to 6.10 ringgit from 6.0 ringgit. Petaling Jaya, Malaysia-based IJM said yesterday a joint venture owned by the company and LFE Corp won the contract to build a hotel in Abu Dhabi from Tamouh Investments LLC. The project is expected to be completed by the end of February next year, IJM said. “We expect subsequent awards to flow over the coming months” following this contract, said Goh, who also raised his forecast for IJM’s 2010 and 2011 profits to RM318.9 million and RM353 million, respectively, on the expectation that the builder will secure more projects worth about RM1.7 billion by the end of the year. “This amount is expected to include two contracts that could be substantial in value,” Goh said. He also expects IJM to participate in the Light Rail Transit extension project in Kuala Lumpur. KUMPULAN Hartanah Selangor Bhd (KHSB) is set to return to the black by end-2009 as it starts to gain from the development of its industrial properties, especially the Selangor Halal Hub (SHH) in Pulau Indah, Klang. The property arm of the state's investment firm Kumpulan Darul Ehsan Bhd also plans to dispose of non-strategic properties to improve its financial standing after suffering a loss of RM35 million in the last financial year ended December 31 2008. "We have fully sold Phase 1 of SHH comprising 88ha of industrial land within four years, worth a total of RM133 million," said its executive chairman Datuk Abdul Karim Munisar. He said Phase 1 is expected to bring in direct investments worth more than RM1 billion, creating about 2,000 new jobs. Abdul Karim said major players that will operate in the area include Ramly Food Industries Sdn Bhd, Felda, Mara and PML Dairies. "All facilities have been put in place. It's only a matter of time before these companies start construction of their facilities. One company has started construction and is expected to begin operations in two years," he said. Speaking to reporters after KHSB's annual general meeting in Shah Alam, Selangor, yesterday, Abdul Karim noted that reclamation works for Phase 2 which involves 97.6ha of industrial land with a gross development value (GDV) of RM234 million have been completed. "Negotiations with potential foreign and local investors are still ongoing, and we expect to conclude sales worth at least RM70 million this year," he said. Abdul Karim said construction of the South Klang Valley Expressway is also expected to enhance the accessibility to Pulau Indah and will be a catalyst of growth for the Pulau Indah development. "We expect to fully sell off Phase 2 within five years," he said. With a land bank of more than 1,600ha, KHSB, together with Kumpulan Darul Ehsan, are also looking into the possibility of venturing into sand and minerals exploration and exploitation to diversify its cash stream. "Besides the 1,600ha of land we have now, the state agency is expected to transfer another 2,000ha of land to us to help improve the cash flow of the company in the future," he said, adding that the firm is in the midst of acquiring a strategic land in Petaling Jaya for a proposed mixed development with a GDV of RM600 million. For financial year ended December 31 2008, the company's revenue dropped 60.08 per cent to RM96.1 million from RM240.8 million previously. SHAH ALAM: Kumpulan Hartanah Selangor Bhd (KHSB) is set to return to the black in the current year ending Dec 31 (FY09) after it disposes of land and reaps profit from its ongoing projects. “Our focus will be on industrial properties, particularly in the Selangor halal hub project on Pulau Indah, Klang. “We also plan to dispose of non-strategic land,” executive chairman Datuk Abd Karim Muniar said, without elaborating. Speaking after a shareholders’ meeting here yesterday, he said the property unit of Selangor’s state investment arm Kumpulan Darul Ehsan Bhd had already locked in sales of RM133mil for its Selangor halal hub. “Phase 1 comprising 220 acres has been fully sold, yielding sales of RM133mil. “The total gross development value of the 244-acre Phase 2 is RM234mil and sales are expected to be completed in three to five years,” Abd Karim said. Talks were ongoing with both foreign and local parties and KHSB expected to secure sales of RM70mil from the second phase of the Selangor halal hub project by the year-end, he said. “Phase 1, which is expected to commence business in the next two years, is projected to bring in direct investment of RM1.06bil to Pulau Indah and create at least 2,000 jobs,” he added. Among the major players that would operate there are Ramly Food Industries Sdn Bhd and Felda Holdings Bhd. KHSB recorded a net loss of RM38.5mil on revenue of RM93.4mil for FY08 mainly due to provisions and impairment losses. The company currently has a total land-bank of 4,000 acres, largely in Selangor. 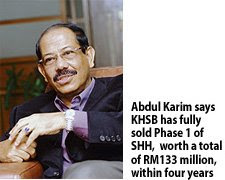 Abd Karim said KHSB was in discussions to acquire a 9.5-acre in Section 14, Petaling Jaya, for a mixed property project with an estimated gross development value of RM600mil. He said the company was also exploring opportunities in the sand and minerals exploration. SHAH ALAM: WCT Bhd has set its sights on taking part in the construction of the proposed RM2 billion low-cost carrier terminal (LCCT) in Sepang. Its deputy managing director Goh Chin Liong said yesterday that WCT, as one of the largest construction and property developers in Malaysia, would want to bid for the construction of the new LCCT. “They have started to call for the pre-qualification exercise of the project through the newspapers and we will just continue to pursue,” he told reporters after the company’s AGM yesterday. Last month, Malaysia Airports Holdings Bhd (MAHB) announced that open tenders for the new LCCT would be out this month and a project management company was appointed. Goh said most construction companies locally were trying to get part of the contract. However, he said it would take several months before WCT received feedback about its interest in the project. While WCT had placed its hopes on securing the new LCCT project, the company was on track to reach its targeted order book of RM1 billion for this year alone, Goh said. The company had earlier in the year secured additional works for the Abu Dhabi F1 circuit and the new Doha International Airport project which amounted to nearly RM500 million. As of March this year, WCT’s order book of RM2.9 billion was sufficient to last until end-2010, he said. “We have cash and bank balances with fixed deposits totalling about RM650 million as per the first quarter of 2009. It is certainly a strong and healthy cash flow,” he said when asked to comment on WCT’s balance sheet. On recent analysts’ reports that WCT was close to securing a billion ringgit infrastructure project in Sabah, Goh neither confirmed nor denied WCT’s involvement but said WCT was among the more active construction players in that state. “If we have secured such a project, we will announce at the appropriate time to Bursa Malaysia. The analysts might not have gotten the information from us and sometimes they speculate,” he pointed out. On the RM720 million upgrading of the Kota Kinabalu International Airport, Goh said WCT had finished building the new wing at the terminal building and it had completed 80% of the refurbishment in the old wing. Goh also said WCT’s objective was to improve its earnings for the financial year ending Dec 31, 2009, despite posting a 29.5% lower net profit to RM39.22 million in the first quarter ended March 31, from RM55.58 million in the same quarter last year. Last year, WCT posted a net profit of RM101.33 million on the back of a RM3.71 billion revenue. WCT fell 16 sen to RM2.03 with 7.03 million shares done yesterday, in line with the weaker overall market. SHAH ALAM: WCT Bhd has given a sombre outlook for the year as big construction jobs get harder to come by and the property market has turned softer. Hazy order-book visibility for WCT and the construction sector as a whole, however, did not hamper the Employees Provident Fund’s (EPF) appetite for WCT shares. Latest filings with Bursa Malaysia showed the pension fund now owns the single largest block of shares in WCT with a 26.3% stake. The EPF started the year holding 18.77% in the company. “It (the EPF) had not asked for board representation,” chairman Datuk Ahmad Sufian Abdul Rashid told a press conference after the group’s AGM yesterday. WCT’s share price took a beating in January and drifted below RM1 by early March on a massive sell-off following the termination of a contract at an on-going project to build a race cource in Dubai. The case is currently under arbitration. Despite the setback, deputy managing director Goh Chin Liong said the group was still actively scouting for new jobs in the Middle East. Earlier this year, it bagged a total of RM500mil worth of new contracts in Abu Dhabi and Qatar. The contracts are additional jobs given by its existing clients. “We are very cautious about taking on new ventures” in view of the weak global economic situation, Goh said. WCT is targeting to achieve RM1bil worth of new order book this year, which is in line with analysts’ expectation. As at end-March, the group’s total outstanding order book stood at RM2.9bil. This includes some RM750mil worth of internal jobs such as The Paradigm commercial development project in Kelana Jaya, Selangor. Several brokerages, including Maybank Investment Bank and RHB Research, had recently linked WCT to upcoming huge infrastructure development projects in Sabah and Sarawak. “All that we can say is that we are active in Sabah,” Ahmad Sufian said. Currently, WCT is involved in ongoing works at the Kota Kinabalu International Airport and a water supply project in Kudat. In September last year, the company launched a high-end residential project called d’Banyan Residency@Sutera in Kota Kinabalu. Consensus estimates put WCT’s current financial year ending Dec 31, 2009 (FY09) earnings per share at 17.3 sen, but falling to 15 sen per share in FY10. WCT’s share price had doubled from its low point in March, and was up 34% year-to-date at RM2.03 yesterday.